The page in a book that describes the lineage of that book, typically including the book's author, publisher, date of publication and generally the printing history of that book. This page is typically within the first few pages of a book on the verso of the title page. 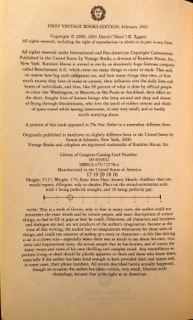 It is referred to as the copyright page for the simple reason that it will often make a legal statement of who owns the rights to publication of the material in the book The copyright generally offers a wealth of additional information to readers, collectors and libraries, including the Library of Congress number for US books, the ISBN for recent publications, credits for the author, editor, and other important personnel in the production of the book, and often even typographical details.